Karaite scholar; lived at Bassora, later at Jerusalem, in the eighth century. He is believed to have been the son of Abu Nissi Noah, who is given in the Karaite tradition as a contemporary and senior of Anan. In the introduction to Nissi's work, of which mention is made below, he relates the privations and sufferings of his life, which he dwelt upon so much that he came to be known as "Rabbi Oaḥ" (the suffering rabbi). This probably accounts for the name "R. Aḥa," by which he is sometimes designated. Nissi lost his parents while a child, and was brought up by a poor and aged grandmother. Thrown upon his own resources when he had scarcely reached adolescence, he managed to earn a poor living by teaching. Later he left his native city and traveled throughout Irak, Persia, and Syria, attended the various schools there, and acquired a knowledge of Hebrew,Aramaic, Greek, and Latin. He next devoted himself to the study of philosophy and rabbinical literature, which he recommends to his coreligionists. In the latter part of his life Nissi settled at Jerusalem, where he probably remained until his death. To Nissi is attributed the "Sefer 'Aseret ha-Debarim" (Firkovich MS. No. 610), containing an introduction to a work, no longer in existence, entitled "Bitan ha-Maskilim," or "Peles Bi'ur ha-Miẓwot," and which treats of the precepts derived from the Decalogue. In addition to biographical matter, this introduction contains Nissi ben Noah's exposition of the principles upon which his interpretation of the Law is based. 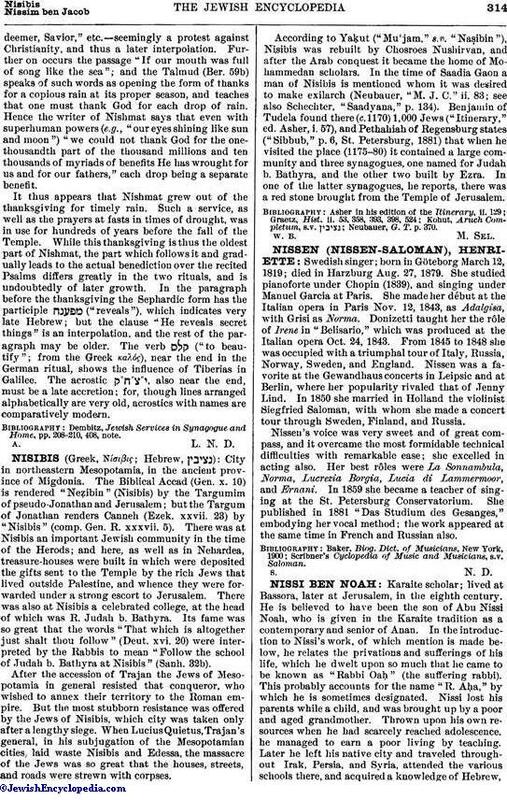 This part was copied by Hadassi without mention of the name of Nissi ben Noah; Hadassi even added to his "Eshkol ha-Kofer" the additional title of "Peles," taken from the supplementary title of the "Bitan ha-Maskilim." 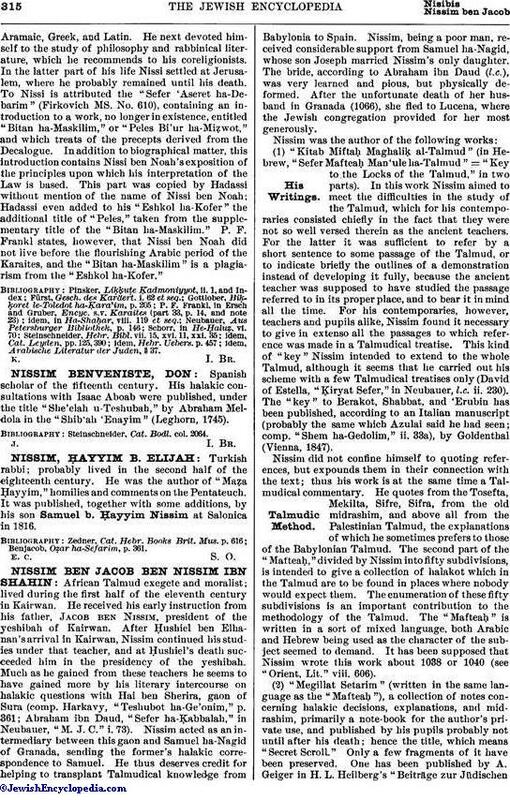 P. F. Frankl states, however, that Nissi ben Noah did not live before the flourishing Arabic period of the Karaites, and the "Bitan ha-Maskilim" is a plagiarism from the "Eshkol ha-Kofer." idem, Arabische Literatur der Juden, § 37.